The Dead Fowl Trainer body is made of soft, natural-feel foam. The free-swinging head and feet are made of hard plastic. This feature insures that a secure body hold will be the dog’s preference, avoiding the hard head and feet. Because the body on this Dokken Dead Fowl Trainer is a foam material it will not sink, even when punctured. With a natural dead bird weight and internal scenting this training aid is a must for your program. 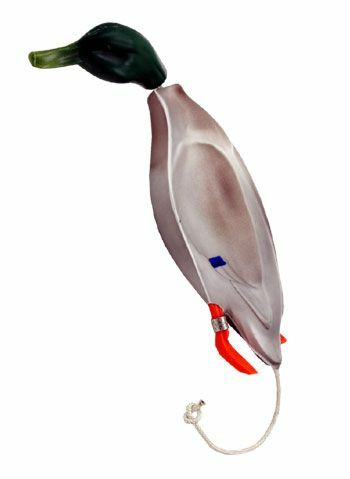 The Dokken Dead Fowl Trainer Duck series lets you train all year on dummies that are the same shape and size of the birds you will hunt come fall. When used on water there is nothing more realistic than the Dead Fowl Trainer Duck series, when you have the proper weight, shape, size, look, and smell, and it trains on every retrieve. Why would you use anything else? To internally scent your Dokken Dead Fowl Trainer: Inject duck scent into the middle of the foam body in six different locations using the Dokken Scent Injector . The natural feel foam body is designed to hold the scent during land training as well as countless hours of water training. (1/2 to 3/4 ounce of scent is sufficient to scent your Dokken). Do not forget to pick up your Dokken Power Grip , Dokken Scent Injector , and 4 oz of Duck Scent for that real hunting/training bird experience. When you cannot have the real bird opt for the next best training tool, Dokken Dead Fowl Trainers. Well, you've certainly earned my loyalty by being so conscientious and timely - great follow-up with your email and voicemail. I'm in hunt tests practically every weekend and training sessions through... -Best regards, Joe K.